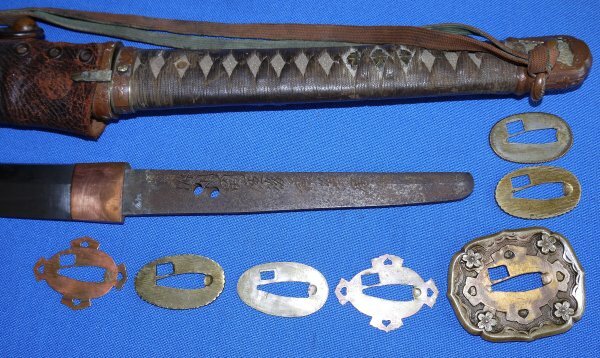 In overall good condition, a WW2 Japanese Army Officer's Shin Gunto with Family Mon attached, blade signed by Goto Kanehiro. This showato gunto has both the sword knot attached (which means it is not a mass surrender item but rather was taken off the Japanese officer in the field) and a family mon (which would have been removed along with the sword knot by the Japanese officer had this been a mass surrender item). The mei / signature is "Noshu Seki-ju Goto Kanehiro saku", a well known and documented smith. 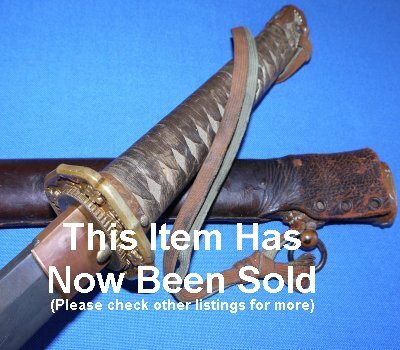 The 26 1/8 inch Nagasa (cutting edge section) blade is in good condition except for one small (non-fatal) nick, aged, with patches of patina, but the hamon still visible. The gunto generally aged but good, the sarute loop has come a little apart but is in place. The saya leather is aged but sound. The sword knot aged and worn. A little damage to the rayskin one side. The sword sheathes and draws well and the locking pin system still works and holds the saya in place. You just wonder what officer this was taken from and under what circumstances; the possible expression variation "take my gunto over my dead body" comes to mind. The sword having been bought by us in the Uk probably means it came from Burma, Malaysia, Singapore, Indonesia or French Indo-China where the British each had forces at the end of WW2. Yours to relish and ponder for just £? (too late, now sold) Please quote item reference P77 (0258). Further / full sized images available upon request.